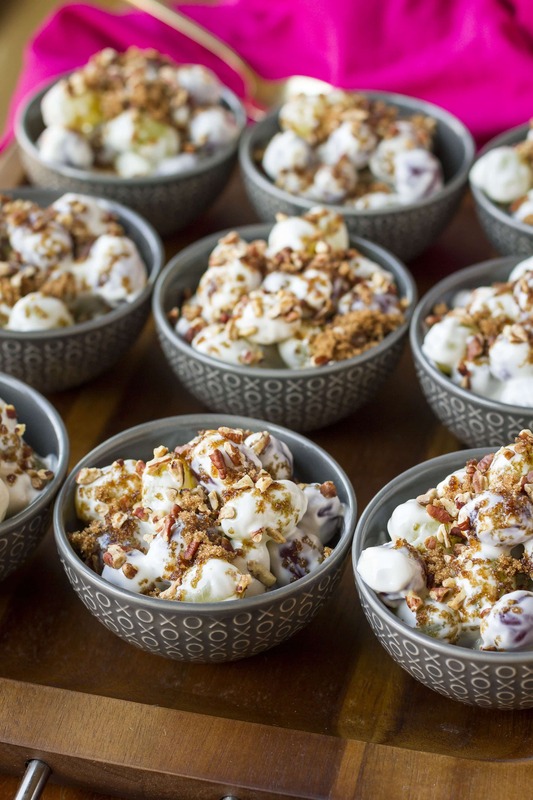 This creamy grape salad has been gracing tables at potlucks, cookouts, and baby showers alike for as long as I can remember. In each case, the result is always the same — an empty bowl that has been completely scraped clean. That’s how good this stuff is! 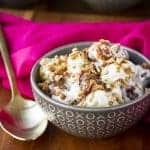 It’s easy to see why… I mean, how do you go wrong with plump, juicy grapes folded into a cool, creamy mixture of cream cheese and sour cream, all topped off with dark brown sugar and crunchy toasted pecans? Correct answer — YOU CAN’T. As with all simple recipes like this, start with the freshest ingredients you can find for best results. Want to know a trick for picking the best bunch of grapes? Look at the vines. If they’re still green and pliable, you can bet the grapes were picked recently. If they’re dried out and turning brown, dig through the pile for a different bunch. I like to use a combination of red and green grapes for visual appeal. You’ll need about 2-lbs. of each, and be sure to wash them really good after removing them from the vines. Grapes are on the Dirty Dozen list, so we want to remove as much residue as possible. Then dry them thoroughly before proceeding with the recipe. To make the “sauce”, simply cream together equal parts softened cream cheese and sour cream, along with a half cup of sugar and a teaspoon of pure vanilla extract. Pour this mixture over the grapes, and fold everything together well. Refrigerate for at least two hours, and then we’ll add the brown sugar pecan topping. While the grape salad is chilling, it’s a good idea to go ahead and toast your chopped pecans so they can cool down. Once they’re cooled, mix them with the brown sugar with a fork. 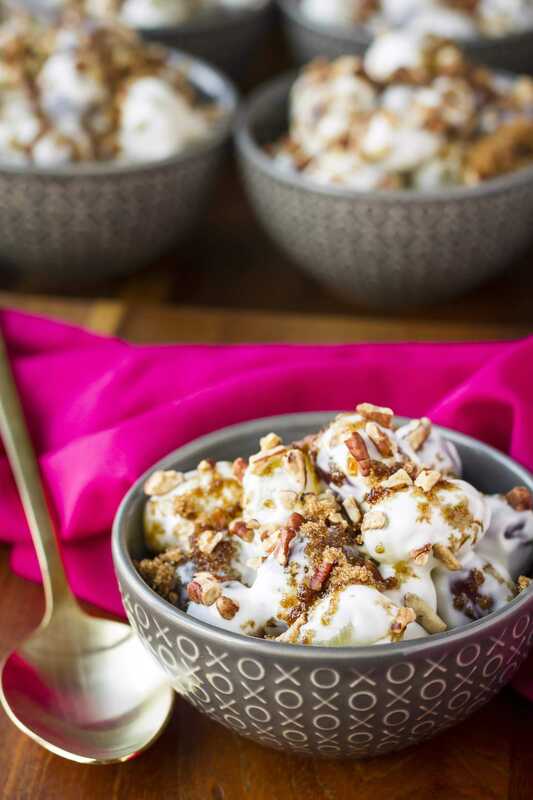 When you’re ready to serve the grape salad, top it off with the brown sugar/toasted pecans mixture. I know what you’re thinking — that’s a LOT of sugar between the sauce and the topping… But everything in moderation, right?! It’s not like we’re eating this on an everyday basis. That’s not saying I wouldn’t if I thought I’d still be able to fit into my skinny jeans, though! For a large gathering, I typically just spread the grape salad out in a 9×13″ dish to maximize the salad to topping ratio. But since I was making it today for a (virtual) baby shower, I thought it would be fun to make individual grape salad cups. 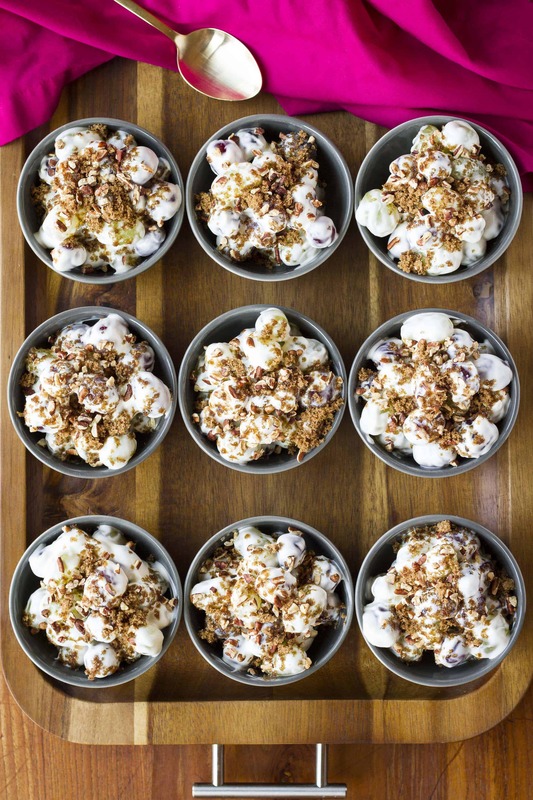 So I just spooned the grape salad into individual bowls, and then sprinkled the topping over each one. Are they cute or what? Wash the grapes well and dry them thoroughly. Cream together the softened cream cheese, sour cream, sugar and vanilla until smooth. 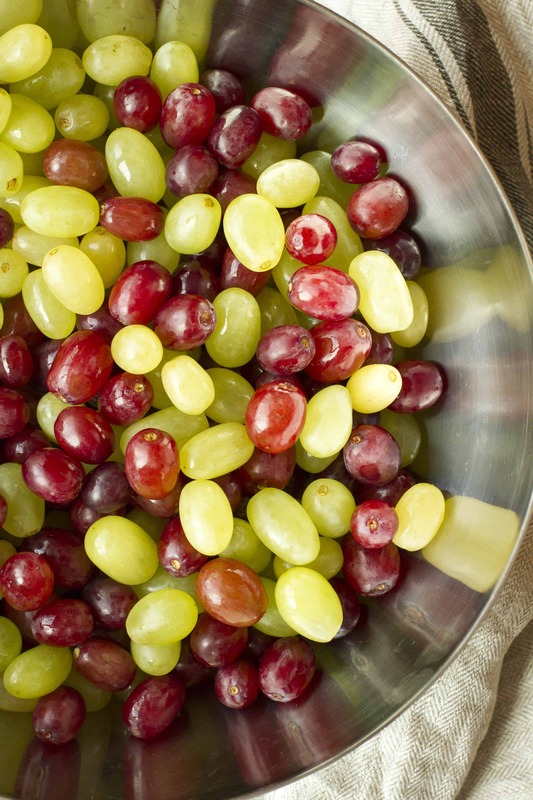 Fold the grapes into this mixture, spread it out in a 9×13″ baking dish, and refrigerate for at least two hours. Mix together the toasted pecans and the dark brown sugar with a fork. Sprinkle this topping over the grape salad just before serving. I’d love to see how your grape salad turns out… Tag me @Unsophisticook on Instagram or use the hashtag #Unsophisticook so I can check it out. Enjoy! I’m totally getting Thomas to make this for me this week!!! (I’m still recovery haha so no kitchen time for me right now) but man oh man does that looks good!! Thank you so much for being a party of my virtual baby shower to celebrate Baby Jackson!!! What a perfect salad for a shower! That looks so delicious and I can’t wait for an excuse to make some! Your recipe sounds delicious–thanks for sharing. YUM! Perfect for picnics, summer parties, holidays and even for a baby shower! The grapes have been fabulous lately and can’t wait to try this. I make this same salad and we love it. But I only use 2 Tablespoons of brown sugar mixed with the nuts. This reciepe sounds so good I am trying it for our family barbeque we all love grapes so it is sure to be a hit. Oh goodness, I can’t believe I haven’t caught that before this… No, it’s the 8-oz. bag that has about 2 cups of pecans in it. Thank you for catching that! I use crushed up Butterfingers for the topping and it’s delicious!!! Oh my gosh, that sounds amazing, Emily! i cant wait to try this recipe, a good friend told me about it so i looked it up and found this neat place to get recipes and store them instead of book marking everything. what i want to know is, do you use powdered sugar? that’s what my friend used, but it just say’s sugar? Welcome, Derinda! I use regular granulated sugar, but I’m sure you could substitute powdered sugar. Nah, it shouldn’t — but I’d probably let it chill for at least two hours if possible. What a great adaptation! Will have to try it. A friend brought this into work for a potluck, it was great! I wanted to try it for a family gathering but since everyone was watching their waistline I altered it a little. I just used the grapes and added french vanilla low fat yogurt. Also I added pecans and additional fruit (apples, strawberries and/or apples). Either way YUMMY!!!! Does it make a difference if I let it chill overnight?? I’m going to use grapes my very first time making this, but I bet it would also be yummy with cherries! That’s a great idea — and I happen to have some cherries in my fridge right now… Might have to give it a try! It is one of my most-requested recipes and always a hit at any type of gathering! You CAN make it more diet-friendly : Simply use the low-fat versions of sour cream and cream cheese and use Splenda instead of the sugar. Though I haven’t tried it this way, I have a friend who did it this way and said you couldn’t tell the difference. I am making this for my in-laws’ surprise anniversary party on Sunday… if I don’t eat it all first. Ha! This looks fantastic, T! You won’t be disappointed. It’s to-die-for good, especially with the toasted pecans! This does look yummy! I can just taste it on fresh strawberries or raspberries! Good choice. I’d love to hear how it turns out! can you use/ have you other things beside grapes? I’ve not tried anything besides grapes, but I think it would be delicious on any kind of berry — strawberries, blackberries, blueberries, etc. You’ve inspired me to try some new combinations! Mmmm, my aunt makes this for potlucks and I love it. So goood! We love grape salad! It is my go to dish to take to church and everyone always loves it! We skip the pecans and instead of 2 cups of brown sugar we use 1 cup of sugar in the raw or demerara sugar for the crunch!